Doug is part of the large Rangitikei Glasgow clan, whose ancestors were early settlers in the Turakina/Rangitikei area. Doug was raised on a dairy farm at Turakina, attended the local primary school and then Wanganui Boys College. On leaving school, Doug spent the next 20 years involved in shearing locally and internationally, and this led to running his own gang for seven years in the Wanganui region. In 1988, Doug returned to his roots and purchased his own property in the Turakina Valley, which he farms in conjunction with selling real estate. Doug has been selling real estate since 2003. 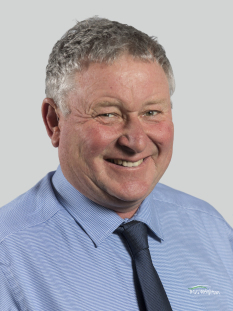 He joined PGG Wrightson Real Estate in 2009 and, since being with the company, he has sold approximately $60 million worth of rural properties. Doug has a proven track record of success in all aspects of rural real estate due to his long involvement in the farming community, which has given him a wide knowledge of the industry and the ability to understand its needs. He is also committed to his community, which includes helping the Turakina Primary School plus being part of the group that sets up the well-known Turakina Scottish Highland Games. Doug offers honesty, commitment and confidentiality.